The presence of numerous players of varying sizes characterize fragmentation yet intense competition in the global safety service market. Investments in cutting-edge technologies and acquisitions to develop innovative safety solutions is the focus of players in this market. This will not only help these companies garner a greater market share, but shape up the market to become an organized one. The global safety service market is primarily driven by increasing trend of workplace safety. The spectrum of workplace safety covers process safety to employee safety to safe data management to asset management. However, with rising complexities of business operations, integration of safety solutions with routine business functionalities is need of the times. This is addressed by customer-centric safety service solutions that integrate everyday business operations with safety solutions to bring about operational efficiency. A report by Transparency Market Research says the global safety service market will be worth US$4,278.2 mn by 2025 expanding at a CAGR of 11.6% between 2017 and 2025. The safety service market based upon component is divided into software and services. The segments under software are incident and action management, safety risk assessment, data analytics, hazard analysis management, process safety management, mobile apps, and others. The segments under services are consulting, project management, analytics, training, implementation, auditing, and certification. The sub-segment of mobile apps under software is predicted to display a significant growth over the forecast period. This is because businesses are susceptible to unpredictable incidents and the timely reporting of safety issues enable responsible personnel to take appropriate action in a timely manner. Apart from this, the sub-segment of auditing under services is expected to rise significantly over the forecast period. The growth of auditing is attributed due to the need to evaluate the status of regulations and policies followed by a company. Software and tools prescribed by safety service providers are used by internal auditors to measure the level of compliance followed at every stage of business operations. These tools also help to identify non-compliance to business protocols. The end-use segments into which the safety service market is divided are oil and gas, petrochemical, chemical, wastewater, utilities, pharmaceutical, transportation of hazardous materials, food and beverage, and others. Among these, the oil and gas end-use industry is anticipated to rise at a significant growth rate over the forecast period. High risk of accidents in oil and gas demands safety solutions that adhere to regulatory compliances. As these industries are generally located in remote areas, reporting of incidents in a timely manner is challenging. Nevertheless, with technology-based solutions, safety service providers furnish a fluid approach that enables reporting of incidents in real time for quick decisions. With increasing shift of companies towards technology-driven solutions, the safety service market is expected to be benefitted especially in emerging economies. Geographically, the global safety service market has been segmented into North America, Asia Pacific, Europe, the Middle East and Africa, and South America. North America currently holds command in the global market. However, Asia Pacific followed by Europe is expected to account for significant market shares over the forecast period. Key names in the safety service market that are profiled in this report are UL LLC, HSE Integrated Ltd., Trinity Consultants Inc., Gensuite LLC, 3E Company, Velocity EHS, Intelex Technologies, Enablon Corporation, Enviance Inc., EtQ Inc., ProcessMAP Corporation, Enhesa Inc., Hygiene Technologies International Inc., Haztek Inc., CSA Group Company, Jaama Ltd, Crown Safety LLC, Workcare Inc., PureSafety Inc., FDR Safety LLC, PrSM Corporation, and Dade Moeller & Associates Inc. This report on the global safety service market provides analysis for the period 2015 – 2025, wherein 2016 is the base year and the period from 2017 to 2025 is the forecast period. Data for 2015 has been included as historical information. The report covers drivers which are ought to drive the safety service market. It also covers restraints and opportunities for the growth analysis of safety service market. 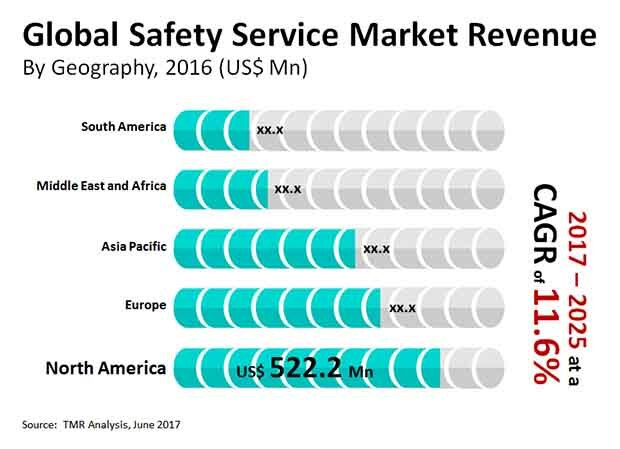 The regional trends covered in the scope of the study is expected to influence the global safety service market growth during the said period. The study provides a comprehensive analysis on market growth throughout the above forecast period in terms of revenue estimates (in US$ Mn) across different geographies. The report also includes key industry developments in the safety service market. Porter Five Force analysis and ecosystem analysis is also covered in the report. The report also covers market indicator which provide supporting factor for the growth of the safety service market. On the basis of component, the global safety service market is segmented into software and services. The software segment is further segmented as incident & action management, safety risk assessment, data analytics, hazard analysis management, process safety management, mobile apps and others. Furthermore, the services component is segmented as consulting, project management, analytics, training, implementation, auditing and certification. The safety service market has wide adoption across various end-use industry such as Consulting, Oil and Gas, Chemical, Petrochemical, Wastewater, Utilities (Excluding wastewater), Pharmaceutical, Food and Beverage, Transportation of hazardous materials, etc. Geographically, the report classifies the global safety service market into North America, Europe, Asia Pacific, Middle East & Africa (MEA), and South America; the regions are analyzed in terms of revenue generation and also included analysis of countries such as U.S., Canada, U.K, France, Italy, Russia, Germany, China, India, South Korea, Japan, Australia, UAE, South Africa, Saudi Arabia, Brazil and Argentina. The market size and forecast for each region and country has been provided for the period from 2015 to 2025 along with the CAGR (%) for the forecast period from 2017 to 2025. The report also includes competition landscape which include competition matrix, market share analysis of major players in the global safety service market based on their 2016 revenues, and profiling of major players. Competition matrix benchmarks leading players on the basis of their capabilities and potential to grow. Factors including market position, offerings and R&D focus are attributed to company’s capabilities. Factors including top line growth, market share, segment growth, infrastructure facilities and future outlook are attributed to company’s potential to grow. This section also identifies and includes various recent developments carried out by the leading players. Key players profiled in the global safety service market include UL LLC, HSE Integrated Ltd, Trinity Consultants, Inc., Gensuite, LLC, 3E Company, VelocityEHS, Intelex Technologies, Enablon Corporation, Enviance, Inc., EtQ, Inc., ProcessMAP Corporation, Enhesa, Inc., Hygiene Technologies International Inc., Haztek Inc., CSA Group company, CSA Group company, Jaama Ltd, Crown Safety LLC, WorkCare Inc., PureSafety Inc., FDRsafety LLC, PrSM Corporation, and Dade Moeller & Associates Inc.